Newly opened vegetarian restaurant in Mylapore (Opposite to Yellow pages) was our next stop for CFG Review. Restaurant in Mylapore did raise a doubt on the Parking space but relieved when we found ground floor has been converted as Parking space. After greeted with ‘hi’ and settling with the CFG team, I personally settled on reading the menu while our welcomes drink – Orange Juice – was on its way. Menu had south-indian, north-indian, tandoor and chat items – a menu that kind of fits whatever your taste bud demands. Starter course was soup and salad and included Cucumber-Onion Salad, Chilly Vegetables, Noodle Salad, Paneer Tikka, Baby Corn, Paruppu Vadai, Tomato / Mulligatawny Soup. Mulligatawny Soup is worth a try. Tasted different and good! Tomato soup was ok but don’t get confused with Cream of tomato. They aren’t the same. Chilly Vegetables was a mix of veggies like Cauliflower, capsicum etc. sautéed in sauce. This was not my personal choice. Noodle salad was good & some crispy noodles added to the crunchy aspect. Paruppu vadai was a tad bid extra crispy yet tasted home-made. From the starter options, do try Mulligatawny Soup and Noodle Salad. From the main course, we had Podi Dosa and Mysore Masala Dosa to start with. 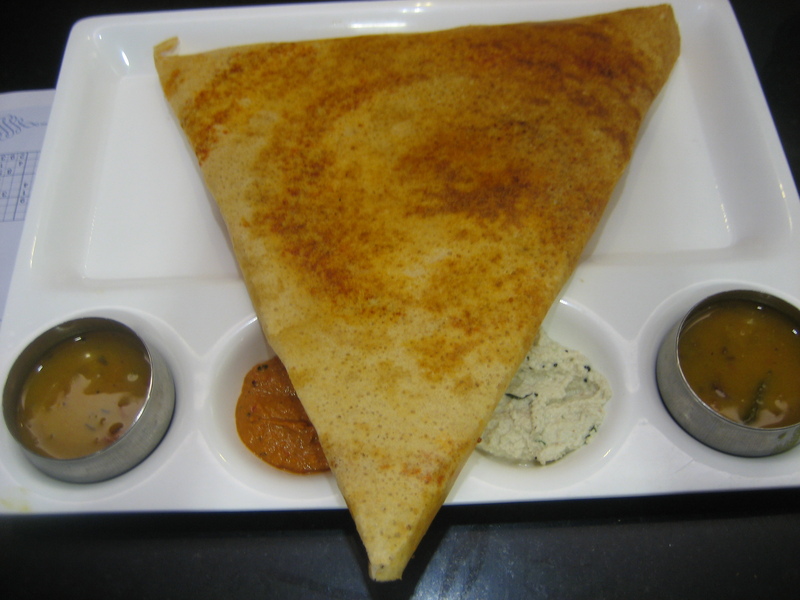 Dosa was served with two varieties of Chutneys and Sambhar. Dosa was like paper roast and since I am a fan of such roast it went well with me. Butter Naan and Paratha accompanied by – Rajma Masala and “Milijuli Subji” and Shahi Paneer, as side dishes were the next stop. I happened to taste only the side dishes reserving space for rice J Among the side dishes, Shahi Paneer scored — was a bit too bland & mildly sweet (coz of the malai) and extra on cardamom. Rajma Masala & Other subji just scores an ok for me to go with Naan or Paratha. Coming to rice items, Vegetable Biryani tasted good. Then it was time to try some Chinese cuisine with Fried Rice & Vegetable Manchurian. Both the dishes were not my choice. Fried rice had a strong Chinese flavor and Manchurian was also Chinese in every bit. Finally it was sweet time when we had a chance to relish Basundi, Gulab Jamun, Carrot Halwa & Ice Cream. Naturally, my all time favourite of Gulab Jamun with Ice Cream went well and I relished it thoroughly. Jamun was nicely made. Carrot Halwa was slightly soft and it also made a good combination with ice cream. Overall food serving our any time hunger needs and living up to filling your hunger, this place has potential to grow and offers reasonable prices. Certainly, a place for people to visit with their family for Sunday Brunch and eat to their laziness. Thanks to Aahar management for having the CFG team. Will I go there again? : Yes, when I don’t want to cook.